This step should ensure Petro Poroshenko's victory in 2019 elections. The presidential administration is considering a constitutional reform that provides for a redistribution of powers from the president to parliament, the elimination of the dualism of power and reducing the number of MPs. Such a reform is meant to secure Petro Poroshenko's victory in the 2019 elections. "First of all, the initiative of such reformatting is extremely beneficial to the image of the head of state. Like, I am the first president who does not cling to power and is willing to share. Secondly, the Fundamental Law of Ukraine is indeed fairly imperfect. A level of dualism does exist not only in the president-cabinet-parliament triangle, but also, for example, between the Ministry of Defense and General Staff, etc. If the rules are not changed, the schizophrenic situation in which every prime minister (who has more powers) is dependent on the president, while the president (who has less powers), as soon as elected to the top office, begins to pressurize the prime minister, taking over his levers of control (Yatsenyuk, Groysman, the name is of no importance)," Sonya Koshkina writes. Also, the plan envisages a reduction in the number of lawmakers from 450 to 250-300 deputies, most of whom are presumed to be elected on party lists, the rest - by majority ballot. "On the face of it, why politicians would need this? The incumbent lawmakers certainly don't - but it would come in very handy for the members of elites. They would be able to come to terms politically even before the elections and then ensure proper campaign returns, knock together a majority so that no one can double-cross anyone. Surely, such situation would make the preservation of the oligarchic regime inevitable but the current government would be more than happy with it," the article reads. Fourthly, the reform envisages depriving the spy agency, SBU, of the tools of a power structure with its subsequent transformation into a classical special service. "Finally, the above processes are rather complicated and would require changing not only the Constitution, but also dozens of key laws. Clearly, all of this time the president will remain in the limelight, acting as a perpetual mobile of the critical transformations," the LB.ua editor-in-chief believes. In order to be on time for the next presidential elections in 2019, Sonya Koshkina continues, preparations should be started immediately: "The presidential election is slated for May 2019, so the campaign should take off in late winter - early spring. Consequently, the campaign's course and rules must be clear by October 2018 at the latest. (The pros and contras of a norm on the election of president by the parliament rather than by general election are still being debated. I recall they sought to pull this trick as Kuchma's second tenure was drawing to an end but dropped the idea for fears of public outcry)." 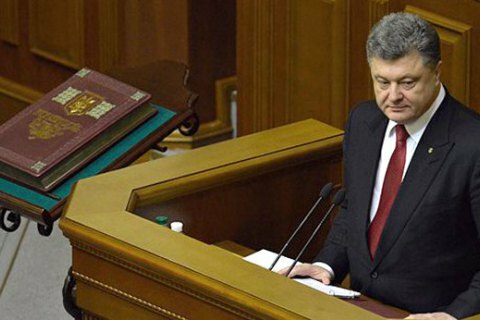 "Amending the Constitution requires two parliamentary sessions, a resolution of the Constitutional Court of Ukraine between them, plus a nation-wide referendum on key proposals would not be in the way," the article says. "Long story short, if they start this fall, the next year it will be done." The mastermind behind this idea, according to Sonya Koshkina, is People's Front, specifically, Arseniy Yatsenyuk and Arsen Avakov, supported by Poroshenko's closest allies Borys Lozhkin, Ihor Rainin and Volodymyr Groysman. Oleksandr Turchynov took a neutral stance but in general approves of the idea. Ihor Kononenko does not support, but "his position 'mirrors' that of the president, and Petro Poroshenko is yet undecided."